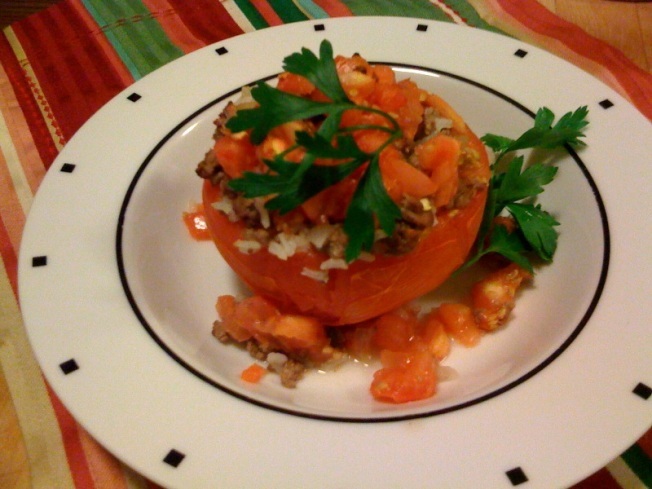 Fresh stuffed tomatoes made with beef, onions, celery, carrots, jalapeños and oregano make a tasty summer meal. It’s tomato season and grocery store and farmers markets are filled with every shape and size. Fresh tomatoes are great as an appetizer or part of a main meal. My standbys with tomatoes are simple caprese salads and as a topping for bruschetta. Plus, here are two more ideas that I think you’ll enjoy. Slice the tops off of the tomatoes. Using a spoon or melon baller, cut the insides out of the tomatoes. Drin the juice and seeds from the extracted pieces of the tomatoes. Turn the hollowed out tomatoes upside down to drain. Roughly chop the tops and inside pieces and set aside. Brown ground beef in a skillet or saucepan over medium high heat. Add salt, pepper and garlic and sauté for 1 minute. Add onions, celery, carrots, jalapeño and fresh oregano and sauté until onions are translucent and carrots are tender, about 15 minutes. Transfer ingredients to a large bowl using a slotted spoon to leave liquid behind. Add rice and half of the chopped tomatoes and mix thoroughly. Place tomatoes in a baking dish just larger than the four tomatoes. Divide the beef mixture among the hollowed out tomatoes and lightly pack. Top the mixture with the remaining chopped tomatoes. Distribute any extra ingredients into the bottom of the baking dish. Bake for 15 20 minutes until just cooked through (overcooking will break down the tomatoes). Remove from oven and carefully transfer each tomato to an individual serving plate. Top with chopped parsley. Core the tomato and then slice it in half. Squeeze each half to release the seeds and excess juice. Place the tomato and all the remaining ingredients except the celery into a food processor. Process until smooth. Remove from the container and add celery. Served chilled with boiled shrimp. If you have any questions or comments, send me an email at wayne@waynesweekend.com or follow me on twitter @MrDomesticDiva.